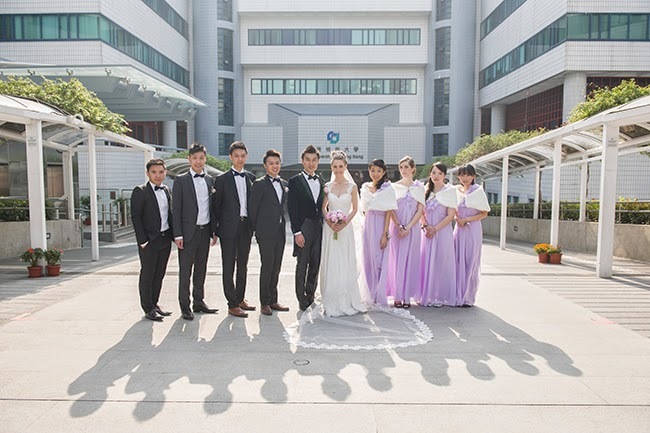 Here is the second part of our Hong Kong wedding reception, which is technically the first, since these are the pictures of what we did on the morning before the actual reception. We went back to the our university, City University of Hong Kong, a very special place for us since it's where we met and became classmates back in 2008, and where we started our relationship in 2010. Our bridesmaids and best men came along to take pictures with us, and it was a really nice morning, being back to that place where we spent three years, now in our wedding gown and suit and with our best friends sharing our joy. I was wearing the dress I had originally bought for our wedding in Catalonia, but which I finally decided was not pretty enough! I'm so glad I got my other dress, the one I actually ended up using for the wedding, because I think it suited me way better, even though this one is nice, too! l finally got to have a pink peonies bouquet!!! 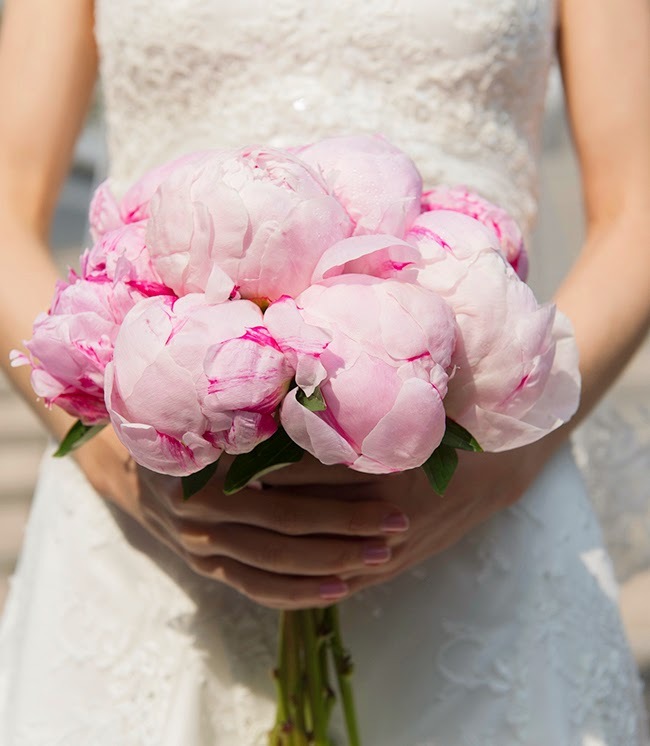 Peonies are my all-time favorite flowers, and I had wanted them for my wedding bouquet so badly, only to be told by my florist that peonies in October were like impossible to get, and even though we could try getting some from the middle-East, the quality couldn't be assured. That's why I finally gave up and sported a mini-roses bouquet, which was actually lovely and matched the whole dress very well, so I was very happy in the end. But anyway, having the peonies in Hong Kong at last was a dream come true! I'd like to thank Tune, Leo, Raymond, Herman, Chloris, Marie, Connie and Sherry, it was lovely having you sharing this day with us! The boys and Connie had already traveled all the way to Catalonia for our wedding in October, they really are way too amazing!!! 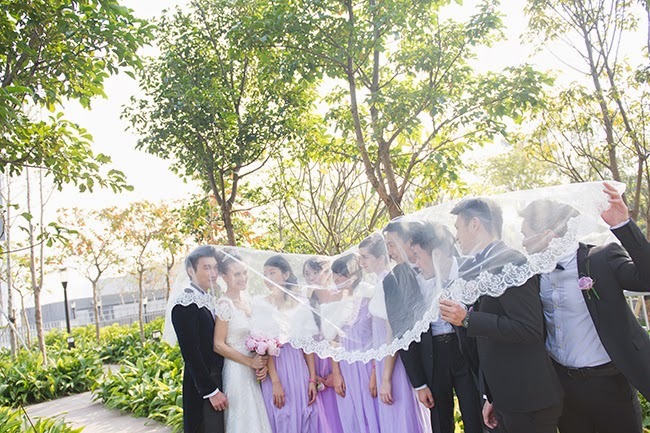 As usual, I have soooo many pictures, and had to chose only a few... Hope you like them and get the feel of what the morning of our Hong Kong wedding reception was like. It was a wonderful day, taking into account it was December 29th! We're elated at the thought of our son joining our family in just 3 months, it's a dream come true! Our little baby boy's name will be Liam. While we liked several names for a girl, we had a hard time coming up with one both of us liked for a boy! We finally decided upon Liam, and we love it!